Our ever popular Dutch Canopies enhance and protect windows in any location and are available in a variety of colours, shapes and fabrics. Dutch canopies have been used in homes for decades, and are increasingly being utilised by high street businesses (amongst others) to provide signage allowing them to attract new customers. Our canopies can be made either rigid or fully retractable, and as always, will completely suit your specifications and circumstances. Many Frame Styles are available with ”no maintenance” white powder coating or anodised satin finished aluminium hardware. Fabrics are either acrylic canvas or PVC and can be supplied fully printed with logos. Enhance your home with a Jayem made-to-measure awning. Enjoy al fresco dining in the shade and extend your evenings with integrated lighting and heating. At Jayem Blinds, all our awnings and canopies are made to fit perfectly over your window or patio doors. Practical and stylish, an awning can add space to your home and garden, as well as protect you, your children and your furniture from the sun’s damaging UV rays. 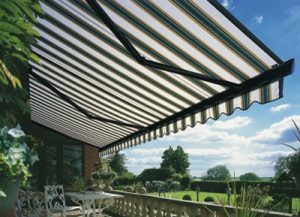 With our fantastic collection, you can find the perfect awning to suit you. From sun-and-wind sensors, integrated lighting and heating to drop down valances, our wide range of accessories ensures you enjoy your awning throughout the year. Beyond style, an awning also provides shade in the summer and protection in the winter, and it must be robust enough to cope with the ever changing weather conditions. A quality awning from Jayem Blinds provides far more than just sun and shower protection, it’s a great alternative to add a splash of colour and new dimensions to your home.